How good is summer? While a gazillion cicada filled the air with their soundtrack, we packed our Trakkadu 400 to the hilt and hit the open road. Yep, you heard right, the 400. It’s a goodie. In fact, this Volkswagen T6 Trakkadu is brimming with features that ensure this luxurious and comfortable adventure mobile is competitive on every level. But more of that later because first stop is… Olney State Forest. Our diesel-fuelled technology provides an easy to use, simple, smarter, versatile cooking solution; with no gas to supply or store, and no open flame within the Trakkadu, the diesel cook top provides a single safe fuel source. Minimal fuel is drawn from the main diesel tank and the stove is powered from the 12-volt house battery; so you can free camp for an extended period of time and rely on the one fuel source. 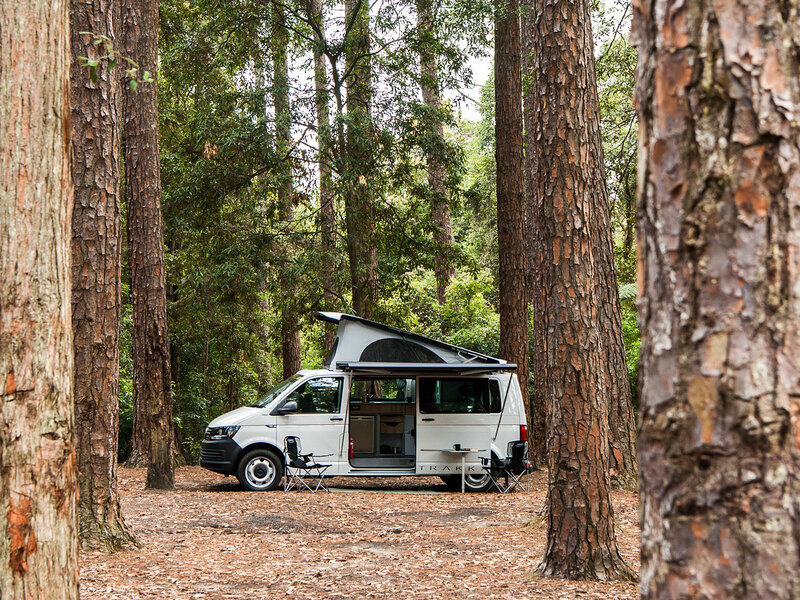 Designed as a standard within all Trakkadu campervans, both front driver and passenger seats include Volkswagen swivel bases. Essentially this means when driving, both front camper seats sit at the same height. 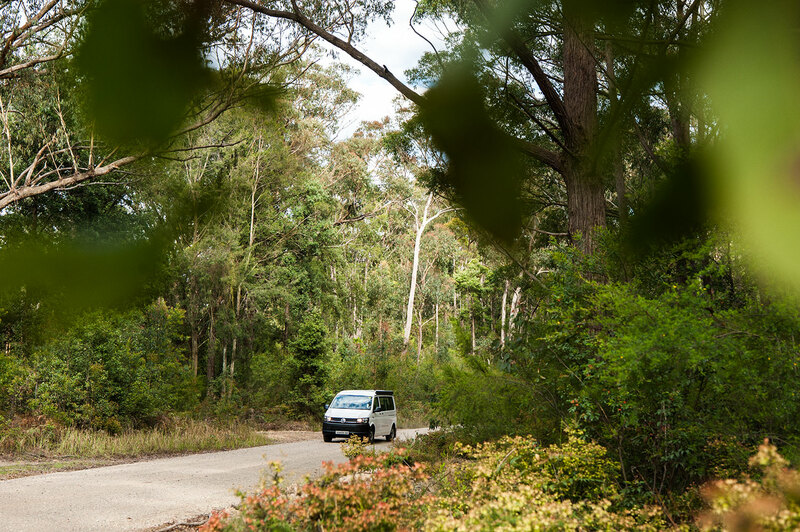 To transform from a touring vehicle into home for the evening, simply rotate from driving position into the main cabin. The front seats also come standard with adjustable armrests and lumbar support so comfort is ensured when lounging and on extended expeditions. If you’ve had anything to do with our VW Trakkadu series over the years you’ll be familiar with how easy it is to operate the gas strut assisted tilted roof. With 3-screened vents, a simple locking system and composite construction for incomparable structural integrity; it’s sleek, it’s strong and it’s seriously simple to manoeuvre. What's more a lightweight, water resistant, breathable, integrated Roof Sleeve made from PU coated material allows you to personalise the amount of ventilation and light within your camper. Enjoy increased boot space or more from your living area. Thanks to a multi position slide system (which runs the length of the cabin), the Trakkadu provides numerous seating positions for dining, travelling or carrying bulky items. While the Trakkadu features ADR approved seating for four people, rear passenger seatbelts are built into the seat so passengers can travel anywhere along the cabin rails. The sliding rear seats are complete with foldaway headrests for passenger comfort, an adjustable backrest and a simple to use bed mechanism. The Trakkadu 400 forms part of TRAKKA’s standard range; however, you can upgrade with the deluxe inclusions of the Plus Pack. To see our 400, or to compare it to our Plus Pack features contact Trakka HQ and arrange to view or test drive one of our demonstrator vehicles today. For those of you planning to travel the east coast of our country, be sure to incorporate a stop off at Olney State Forest. If you’re on instagram you can find a number of great shots at #visitnswforests and for Facebook users check out @visitnswforests for some extra inspiration!